Toys—like cars and dinosaurs—encourage little Fox to begin exploring this mini landscape. Dinos graze in a jungle sprouting atop an old Charleston building. Down on the street, cars idle, ready to vroom up the walls and into the trees. In a child’s world, anything can happen. The same can be said for a container garden designed to encourage play—and nurture little growers’ knowledge about the natural world. To make a kid-friendly planter of your own, think up a theme that will appeal to your child. Creating three site lines—say, a street level, a rooftop, and a tree canopy—will offer them more options to explore and relate. Then select a container (with drainage holes) large enough to accommodate both plants and toys. We turned ours into a building by snapping a photo of windows at The Citadel that we printed on water slide decal paper. After applying the decals to the pot, we sealed them with acrylic spray. ■ Dwarf ficus tree (Ficus benjamina) forms a canopy. 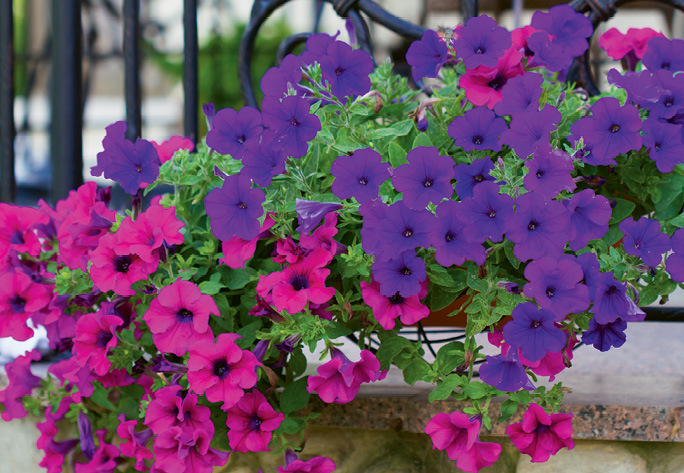 ■ Superbells (Calibrachoa) and Mexican heather (Cuphea hyssopifolia) deliver blooms that attract pollinators. ■ Variegated sweet flag (Acorus gramineus), fiber optic grass (Isolepis cernua), and Scotch moss (Sagina subulata) create a lush jungle look. ■ Peppermint-scented geranium (Pelargonium tomentosum) attracts mini gardeners with its sweet fragrance. ■ Lamb’s ear (Stachys byzantina) is wonderfully soft and fuzzy. ■ Creeping Jenny (Lysimachia nummularia) and sweet potato vine (Ipomoea batatas) are fast growers that will cascade beautifully. Plant the container using nutrient-rich potting soil, then let your child loose and watch where that wild imagination roams. 1. Instead of using one large pot, group smaller ones to create a village. 2. If you’re planning to add photos to your planter using water slide decals, consider photographing a place your child enjoys—whether that’s a park or an attraction like the South Carolina Aquarium. 3. Play with scale, adding a rock to make a mountain, for example. 4. Sink a plastic cup into the soil surface to form a water feature. 5. Create context for your container by drawing chalk roadways on a patio surface. Ask an Expert: When it comes to fertilizing, what are the bare-minimum musts?